This article is about the singer. For the fictional character, see Up in the Air (2009 film). "The Dead Horses" redirects here. For other uses, see Dead Horse (disambiguation). 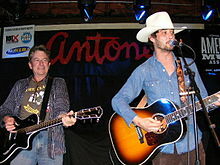 George Ryan Bingham (born March 31, 1981) is an Americana singer-songwriter currently based in Los Angeles, California. After receiving critical acclaim for his first two studio releases on Lost Highway Records, 2007's Mescalito and 2009's Roadhouse Sun, Bingham went on to collaborate with Grammy-winning producer T Bone Burnett on the soundtrack for the 2009 acclaimed film Crazy Heart, including notably co-writing and performing the film's award-winning theme song, "The Weary Kind". The title track earned Bingham an Academy Award, Golden Globe Award, and Critics' Choice Award for "Best Song" in 2010, as well as a Grammy Award for "Best Song Written for a Motion Picture, Television or Other Visual Media" in 2011. The Americana Music Association also honored Bingham with the organization's top award in 2010 as "Artist of the Year". In 2013, Bingham wrote and recorded "Until I'm One With You", the theme song for FX TV drama series The Bridge. The song is Bingham's first screen track since his Academy Award win for best theme song in 2010. "Until I'm One With You" was released as a digital single on Bingham's own Axster Bingham Records label on June 25, 2013. On August 6, 2016, Bingham recorded his first live album, "Ryan Bingham Live", at Whitewater Amphitheater in New Braunfels, TX. The album was released on October 21, 2016 through Bingham's own label, Axster Bingham Records. The entire Whitewater Amphitheater show was also filmed and streamed live by Amazon Music. Bingham was born in Hobbs, New Mexico. His family relocated to the Midland/Odessa area of West Texas, before eventually moving to Houston. He attended high school primarily in Houston, Texas, at Westfield High School. Bingham's mother purchased his first guitar when he was 16-years-old. Although he was fascinated by music, he left his guitar dormant in his closet. Roughly a year later, Bingham hitchhiked back west to Laredo in hopes of landing a job with his Dad, carrying the guitar with him on the trip. Bingham's father enjoyed having neighbors over on their porch to drink beer, and one of them taught him a classical Mariachi song called "La Malaguena" in segments. Though he loved playing the song, it was the only one he would learn during his time in Laredo. He relocated to Stephenville, Texas. There, he began learning more music while also riding on the rodeo team at Tarleton State University. It was in Stephenville that he would wrote arguably his most well-known hit "Southside Of Heaven" in a trailer house. He also began to play local gigs there, namely a local golf course and a few small bars. While in Stephenville, Bingham had a friend that caught wind of a job in Paris, France with the "Wild West Show" at the Disney resort. He bought a one-way ticket with $100 in his pocket. Upon arrival, he was informed that the manager he had a mutual friend with was no longer with the company, and he found himself stranded with his guitar and old riggin' bag from his rodeo days. Luckily, he found some friends-of-friends within the Disney programs, and began playing music in local parks for tips. Eventually he saved enough money to get back to Texas, and moved in with a rodeo buddy near Fort Worth. His friend had a brother (Matthew "Papa" Smith) that cut hair during the day, and played drums as a hobby. After an introduction and impromptu gig at an empty bar in Fort Worth, he and Papa would go on to be the founding members of Ryan Bingham and the Dead Horses. Marc Ford of the Black Crowes was one of the few people in the bar that night. He approached Ryan after the gig with an offer to record an album. After issuing self-released "Wishbone Saloon" and "Dead Horses", the latter distributed by Lone Star Music, Bingham was signed to Lost Highway Records, who issued his first major label debut with Mescalito on October 2, 2007, produced by former Black Crowes guitarist Marc Ford. Texas Music Magazine has opined that "Bingham talks and sings with a whiskey-and-cigarette throat that screams hard living. Hard in a way that can make a 29-year-old sound like a 50-year-old Tom Waits." Bingham spent several years on the rodeo circuit: He began bull riding in his late teens. Bingham's former band, The Dead Horses, was composed of Matthew "Papa" Smith (drums), Corby Schaub (guitar and mandolin) and Elijah Ford (bass). The bass player on Mescalito was Jeb Stuart. They appeared alongside Bingham with the Drive-by Truckers on the PBS show Austin City Limits in October 2007. The first single from Mescalito, entitled "Southside of Heaven," was released on November 30, 2007. The second single was entitled "Bread and Water." On June 2, 2009, Ryan Bingham and The Dead Horses released their second studio album titled Roadhouse Sun via Lost Highway Records. It was once again produced by Marc Ford. Bingham performed two songs for the soundtrack of the movie Crazy Heart, including "I Don't Know," and the theme song, "The Weary Kind." The song was co-written by Bingham and producer, T Bone Burnett. Bingham also played a small role in the film as Tony. On January 17, 2010, Bingham was awarded the Golden Globe for Best Original Song for "The Weary Kind". The song also won the 2010 Academy Award for Best Original Song, the 2010 Grammy award for Best Song Written for a Motion Picture, Television or Other Visual Media, as well as Song of the Year at the 9th Annual Americana Music Association awards. Bingham's third major label release, Junky Star, was released on Lost Highway Records on August 31, 2010. On September 18, 2012, Bingham co-produced and released his fourth studio album Tomorrowland on Axster Bingham Records. The first single released from Tomorrowland was "Heart of Rhythm." Both the single and the official lyric video debuted on Americansongwriter.com on July 30, 2012. Bingham’s second Tomorrowland single "Guess Who’s Knockin" debuted on Rollingstone.com on September 6, 2012. The official music video for "Guess Who’s Knocking" premiered on Pastmagazine.com October 4, 2012. Bingham released a song titled "Back By the River" on "The Musical Mojo of Dr. John: A Celebration of Mac and his Music," in 2016. In 2013, Bingham's song "For Anyone's Sake" appeared in the closing credits of the feature film Joe, starring Nicolas Cage. Bingham wrote the song for the film, the song was released as part of the film's original soundtrack in April 2014. In 2014 Ryan Bingham starred opposite Imogen Poots in the independent film "A Country Called Home," directed and co-written by his wife, Anna Axster. Bingham also wrote and recorded the film's title track "A Country Called Home," the song was released digitally through Bingham's own label, Axster Bingham Records, on May 6, 2016. In 2018, Bingham has a guest role in the contemporary Western television show, Yellowstone, as Walker, the itinerant ranch hand. In December 2018, Bingham announced that he would be releasing his sixth studio album American Love Song in February 2019. Bingham has appeared as a guest on Bob Harris's Country Show on the BBC's Radio 2. Daryl Easlea, writing for the BBC's folk and country review, said "Bingham will be one of the names to drop in 2008, with an album that sounds as if it's been unearthed from 1972." Ryan Bingham & Joe Ely - Antone's during SXSW 2008 - Austin, TX. Bingham currently lives in Los Angeles, California with his wife Anna Axster, who also directed his music videos. He announced at his performance in Austin, TX on March 5, 2015 that he and his wife were expecting their first child in the summer of 2015. Bingham's song "Broken Heart Tattoo" from Fear And Saturday Night is a reflection about what he would like to say to his unborn child. Ryan's mother drank herself to death and his father committed suicide. Bingham's "Never Far Behind" from his "Tomorrowland" album is about his parents. "Until I'm One with You"
^ "iTunes album review". September 18, 2012. ^ Greg M. Schwartz (October 23, 2012). "PopMatters.com review". ^ "Ryan Bingham Biography - AOL Music". Music.aol.com. 1981-03-31. Archived from the original on March 12, 2010. Retrieved 2011-03-15. ^ Martinez, Jose (October 2010). "Ryan Bingham & The Dead Horses On the Road... Again". Venice Magazine. Archived from the original on September 28, 2011. Retrieved 5 July 2011. ^ Kennedy, Gerrick (13 February 2011). "Grammy Awards: Ryan Bingham nabs a trophy, still puts on pants 'one leg at a time'". Los Angeles Times. Retrieved 5 July 2011. ^ "Ryan Bingham Interviewed by 3DotMag". ^ "Ryan Bingham Conquers Fear and Loathing to Rock the American Dream". PopMatters. 2015-12-02. Retrieved 2019-02-23. ^ "wellREDpodcast The 100th episode celebration with Ryan F***ing Bingham!". ^ "Ryan Bingham's website, quoting the magazine article". Binghammusic.com. 2014-07-09. Retrieved 2014-07-27. ^ McCartney, Kelly. "Pop Matters website interview with Ryan Bingham". Popmatters.com. Retrieved 2014-07-27. ^ "Artists : Artists A to Z : Ryan Bingham Biography : Great American Country". Gactv.com. 2014-06-27. Archived from the original on 2012-02-11. Retrieved 2014-07-27. ^ "Oscar nominations announced". ew.com. 2010. Archived from the original on February 5, 2010. Retrieved February 2, 2010. ^ "Jeff Bridges, Ryan Bingham, T Bone Burnett Win Oscars for Crazy Heart". cmt.com. 2010-03-08. Retrieved 2010-03-08. ^ "Ryan Bingham". 22 May 2018. ^ "ARTISTRY WINS DURING 9th ANNUAL AMERICANA MUSIC ASSOCIATION HONORS & AWARDS, Ryan also played at the ACL festival in 2011". sesac.com. 2010-09-10. Retrieved 2010-09-13. ^ "Press Play: New Music". Tulsaworld.com. Retrieved 14 September 2016. ^ "Joe (Original Motion Picture Soundtrack) by Jeff McIlwain & David Wingo". 8 April 2014. ^ "Joe" – via Amazon. ^ "A Country Called Home - Single by Ryan Bingham". 6 May 2016. ^ "Mescalito : Ryan Bingham : Review". Rolling Stone. Retrieved 2014-07-27. ^ Gold, Scott (2008-03-30). "Raw and Genuine". Los Angeles Times. Retrieved 17 November 2016. ^ Smyers, Darryl (2010-10-07). "Q&A: Ryan Bingham Talks Growing Up in Texas, Sharing His Name with George Clooney and Coming to Grips With Winning an Oscar | Dallas Observer". Blogs.dallasobserver.com. Retrieved 2014-07-27. ^ "Ryan Bingham Interviewed by 3DotMag". Youtube.com. Retrieved 14 September 2016. ^ Newman, Melinda (2015-01-20). "'Fear and Saturday Night': How Ryan Bingham Defeated Darkness on Surprising New LP". Rollingstone.com. Retrieved 14 September 2016. ^ a b "Ryan Bingham Album & Song Chart History - Country Albums". Billboard. Retrieved January 8, 2011. ^ "Ryan Bingham Chart History - Billboard 200". Billboard. Retrieved January 8, 2011. ^ "Ryan Bingham Chart History - Folk Albums". Billboard. Retrieved January 29, 2015. ^ "Ryan Bingham Chart History - Rock Albums". Billboard. Retrieved January 8, 2011. ^ "Ryan Bingham Chart History - Heatseekers Albums". Billboard. Retrieved January 8, 2011. ^ "Ryan Bingham Chart History - Independent Albums". Billboard. Retrieved September 27, 2012. ^ "American Love Song by Ryan Bingham on Apple Music". Apple Music. Retrieved February 20, 2019. ^ "Ryan Bingham Album & Song Chart History - Country Digital Songs". Billboard. Prometheus Global Media. Retrieved October 21, 2016. ^ Whitburn, Joel (2011). Top Pop Singles 1955–2010. Record Research, Inc. p. 83. ISBN 978-0-89820-188-8. ^ "Ryan Bingham Announces 'Fear and Saturday Night,' Shares New Song 'Broken Heart Tattoos' (Exclusive)". October 23, 2014. ^ "Ryan Bingham - Radio (Radio Edit)". December 2, 2014. ^ "Ryan Bingham - Hands Of Time". March 31, 2015.